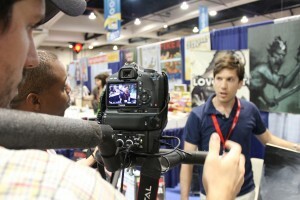 Production stills: Comic-Con 2010 : COMICS ARE EVERYWHERE! These photographs were shot during our first substantial shoot at the 2010 Comic-Con International. Our production team interviewed a range of established and emerging comic creators and fans alike as we gathered footage for the project’s narrative. We also selected potential characters to follow for the evolving non-fiction narrative. These select images are a few of pictures capturing the playful, communal spirit of the annual gathering of the tribes that is Comic-Con!